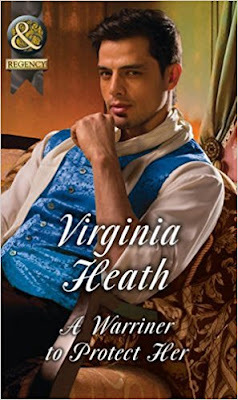 Book Review: A Warriner to Protect Her by Virginia Heath. *Currently preforming my happy new author dance!! * Okay, I'm done! :p I've been talking about Virginia Heath and her Wild Warriners a lot on Twitter the last week and rightly so. 'A Warriner to Protect Her' is the first book of Virginia's I have read and I was over the moon with it. When Virginia got in touch with me about the Wild Warriner four book series, I was intrigued to find out more about the stories and what each book would entail. Now that I have read the first one, I am positively beaming about the fact that this is a four book series and that each of the Warriner brothers get's their own story. I should probably give you a little more information about the story first, shouldn't I? Violet Dunston is in a terrible situation, her only living relative is forcing her to marry someone old enough to be her Grandad, in order to get his hands on her Tea fortune. Her future husband is a horrible man and if she doesn't do something fast, she's looking at a very unhappy life, if they even decide to keep her alive. Being bound and gagged doesn't stop her from escaping their evil clutches, but after a night in the woods bruised, beaten, wet and cold, Letty needs help and soon. Jack Warriner may have had a bit to drink but he's definitely not imagining the pale, soaking and obviously injured woman in the road. When she collapses in front of him, it's his instinct to protect her. Who is she and where did she come from? Taking her back to Markham Manor, his brothers help him aid this damsel in distress to full recovery. When they discover the true nature of the situation she is in, the brothers join forces to keep her safe. Jack in particular won't let anyone harm her and that's a promise. A Tea heiress and an infamous outcast of the ton. Jack and Letty couldn't be more unsuited. But there's more to them both that meets the eye. I kid you not, from the second chapter, I was well and truly hooked on Letty's story. The desire to see her safe and out of harms way was so strong that, at certain moments, I felt like I was watching a thriller and didn't want to look but also couldn't help myself. When Jack found her I audibly sighed with relief and wanted her to stay at Markham Manor forever. Letty herself was a wonderful character. I found her to be sweet in her efforts to help the four Warriners, brave, to escape her Uncle and the despicable Earl, inspiring, in that every new challenge she came across, she faced head on and put her all in to it and I also found her funny. All her little blunders and unknowing mistakes made her extremely likable, so did the way she took charge and was so sure of herself and her feelings when it came to Jack. Apart from all of the above, my favourite thing about 'A Warriner to Protect Her,' was that in the midst of the fear, romance, heartache, sadness and family issues, there was humour and a lightheartedness that made me giggle. From the brothers, to Letty's little demands, to the way Letty and Jack spoke to each other, there were so many moments that had me grinning like a crazy person. Especially at the end when...well actually I won't tell you about the end. I'm not about to spoil it for you! Pick up Jack and Letty's story now!